Few World War II fighters inspired awe in both friend and foe like the F4U-1A Corsair. Capable of speeds in excess of 400 mph, it left a ghostly howl in its wake that earned it the name "Whistiling Death" among enemy troops. For those under its protection, however, there was no sweeter sound on earth. 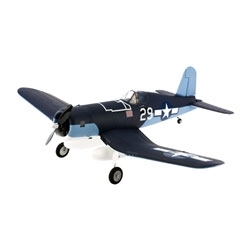 The ParkZone® F4U-1A Corsair is a remarkably scale tribute to this warbird icon that's a blast to fly. Most of its details, including the paint scheme, are already applied for you. A set of bolt-on drop tanks and two sets of decals are included. In the air, its potent 15-size, 950Kv brushless motor will deliver all the power you need for high-speed strafing runs and spirited sport aerobatics. For a truly spectacular Corsair experience, add the optional flaps and E-flite® electric retracts. * The model has been designed to make installing these options quick and easy, and its Spektrum™ AR600 receiver has all the channels you’ll need. *Requires two ParkZone SV80 Servos (PKZ1081) and E-flite 10- to 15-size 90-Deg Rotating Electric Retracts (EFLG120), all sold separately. A 4+ channel DSM2 or DSMX compatible Transmitter. 6 channels are required for flap and retract operation.